How Do I Prepare For A Smooth Closing? There are several things you can do to be certain that your real estate transaction will close on time, and that everything will go smoothly. A day or two before closing, you should review your final closing statement or HUD-1 Statement, whichever is used in your area of the country. You should go over all the calculations and be certain that you are given credit for all your deposits and any other credits due to you from the seller or for other items agreed upon between buyer and seller. Go over all the lender and title and escrow fees, to be sure they are what you had been told and that you agree to them. Check the math calculations on the closing statement. Errors do occur. Carefully review the preliminary report or the guarantee of title insurance, to verify the exact legal description of the property and any liens, encumbrances or other items which may have been discovered on the property. Be sure that all items are removed that you did not agree to. Verify that the title or escrow agent has your correct vesting, or the way you want to take title to the property. This is important because to correct a vesting on a deed later on is time consuming and can be avoided if care is taken when escrow is closed. Besides the paperwork which you must review and verify, you should reinspect the property once again just prior to closing. Is everything the way you expect it to be? Have all the necessary repairs or other corrective work been done that were promised to you? This is important so that you don’t arrive at your new house and find unexpected surprises. The most important thing to remember is that before closing you want to be certain that all the conditions of the purchase contract have been met. You want to be sure that all directions given to the closing agent have been performed. Before signing your name to any closing documents, check and double check that everything is correct, interest rate, fees charged and condition of the property. 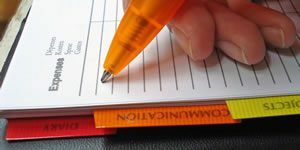 Make up a “Home Closing Checklist” of items to review prior to committing your signature to your closing documents. Write down all your questions. Be sure you are satisfied with all property inspections and charges and fees which you must pay. Be certain you have been credited for any credits promised to you. Remember to arrive on time at the closing and to bring a valid form of identification with you. Your signature cannot be acknowledged by a Notary Public unless you show official proof of your identity. Copyright © 2009 Sandy Gadow. This article may not be resold, reprinted, resyndicated or redistributed without the written permission from Escrow Publishing Company.